Quickmap can be registered with or without an internet connection. To register Quickmap with an internet connection, run QuickMap. The registration form will display automatically if registration is necessary. If not, you can press F12 from within QuickMap (or click Help -> Register Quickmap). When the Registration form is displayed, type in your registration key including the “-” character as shown below, then click the Register ONline button. QuickMap should now be registered. 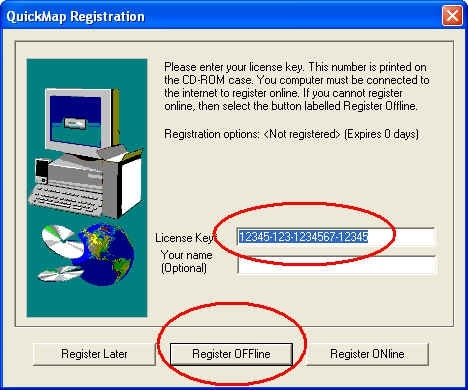 If you do not have an internet connection, or QuickMap is denied access to the Internet by your firewall, follow the Offline registration process below. Run QuickMap. The registration form will display automatically if registration is necessary. If not, you can press F12 from within QuickMap. When the Registration form is displayed, type in your registration key including the “-” character as shown below, then click the Register OFFline button. The QuickMap Offline Registration form will display. Note down the number shown on that form for use in Step 3. ❗ Hint: If Internet Explorer works on your PC, swipe the number with your mouse and press CTRL + C. This will copy the number into the clipboard for use in Step 3 below. 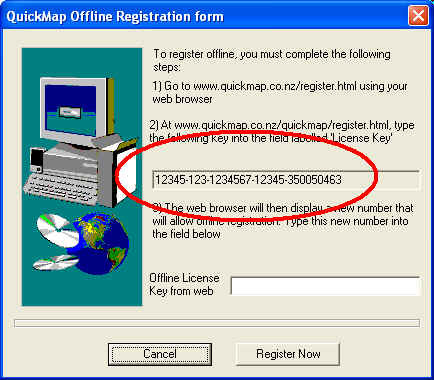 Open your web browser, and go to www.quickmap.co.nz/register.html, then type in the number copied in Step 2 above. If you copied the number onto the clipboard, you can press CTRL+ V to paste the number in. If the number typed in was valid, your web browser will now display another number. Copy this number displayed in your web browser for use in Step 5. Return to your QuickMap registration form in the Quickmap program, and paste in the number from Step 4. Click the Register Now registration button. QuickMap should now be registered.